After being treated to a wonderful Italian dinner at a local restaurant last week, I was inspired to finally try to make my own marinara sauce. I'll admit, usually I'm too lazy and I'd much rather just buy a jar (which isn't that expensive to begin with, about $2 or $0.40 per serving), doctor it up and go with it. I've also been skeptical whether or not homemade sauce would actually be cheaper since you still have to buy cans or fresh tomatoes for the homemade... both of which can add up quickly. Well, the verdict is in! 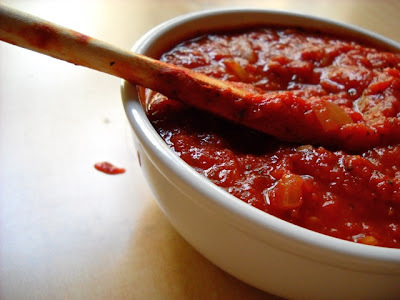 My sauce costs almost half as much per serving as the jarred kind and it's scrumptious! It's not quite the deep, intense, sweet sauce that I had at the restaurant but hey, I'm not Italian so all I can do try! STEP 1: Finely dice the onion and garlic. Cook in a large pot with 3 Tbsp of olive oil until very soft and slightly golden brown. I wanted to make a sweeter sauce which is why I let the onions and garlic caramelize a bit. If you don't like sweet sauces, proceed to the next step before they get any color on them. STEP 2: Add the rest of the ingredients (crushed tomatoes, tomato paste, basil, oregano, bay leaves, brown sugar and balsamic vinegar) to the pot. Simmer on medium/low for one hour. Be careful of the splattering sauce! 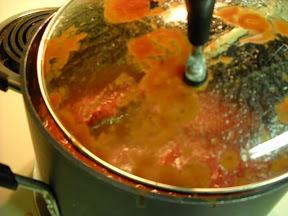 Leave a lid on the pot but slightly ajar to allow steam to escape but keep flying blobs of sauce from landing on your counter top. STEP 3: Taste the sauce after a half hour or so and adjust spices and seasoning to your liking. The proportions listed above yield a slightly sweet and tangy sauce. If you like savory sauces, leave out the balsamic vinegar and reduce the sugar to 1 tsp. Some sugar is usually needed to balance the high acidity of the tomatoes. NOTE: If you plan on freezing some of your sauce (I don't know who can eat 6.5 cups of sauce within a week...) make sure to cool the sauce in the refrigerator first in a covered container. Once cool, transfer to heavy duty freezer bags and label. 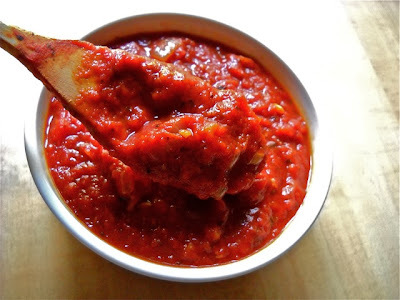 Marinara sauce freezes great and is super easy to take out and thaw whenever you need!